Achieving the American Dream of Home Ownership is high on the list for most people. 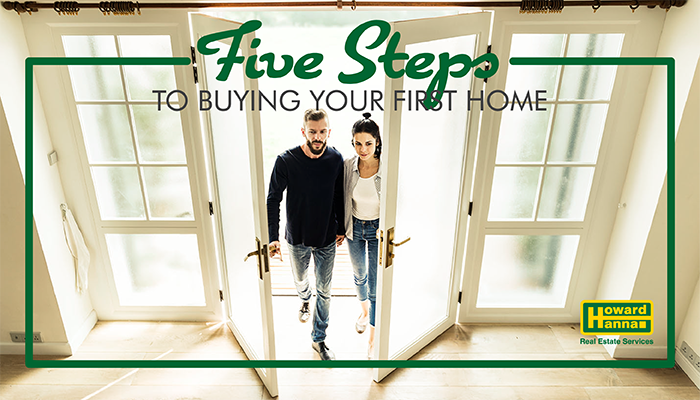 Buying that first home is one of the biggest purchases most of us will make in a lifetime, and the process can be a bit intimidating. Financially prepare yourself to buy a house. Begin by looking at your lifestyle, career, and future plans. Where do you want to live in five, ten or fifteen years? Consider making a list of the pros and cons of purchasing a home. Check your credit score for any errors or past-due accounts. Before you even attend your first open house, find a mortgage loan originator and get a mortgage pre-approval. The pre-approval will help ensure that your home search meets your financial needs. Remember, you will also need cash for a down payment, closing costs, move-in expenses, and more. Find the right Howard Hanna agent. Our experienced agents are in local offices across eight states. Our team has the expertise to guide you seamlessly through the process of purchasing your first home. Your Howard Hanna agent will be your advocate as you identify potential roadblocks, go to bat for you when it’s time to negotiate pricing, and ultimately celebrate with you as you move into your first home! Find an agent who’s right for you. Research the kind of neighborhood and home you want. No house and no location will ever be flawless, but it’s important to go into your home search with an idea of where you’re willing to compromise. Visit homes at different times of day, attending open houses as well as private showings. Most of all, focus on the right things! Black walls can be painted, outdated appliances can be replaced, but it’s far more difficult to add a second story or update a bad floor plan. Your real estate agent can help you expand or contract your search parameters depending on the market. Be ready to make an offer quickly. Once you’ve found the house of your dreams, it’s time to make an offer. High-quality homes that are priced to sell, well maintained, and in desirable neighborhoods can sell quickly in today’s competitive market. It’s normal to want to take some time to think before making an offer, but you may not want to wait long. Don’t make the mistake of skipping the home inspection. It’s important to be an informed buyer. A home inspection helps protect you if there is a need to renegotiate your offer based on its findings. Pack up and move into your new house! After doing your final walkthrough and signing the paperwork at the closing, you will officially own your new house. Congratulations! Howard Hanna has partnerships with preferred vendors throughout the eight markets we serve. These partners can help you make a smooth, easy transition to your new home. Be sure to ask your agent for recommendations from our list! Lastly, don’t forget that Howard Hanna has an exclusive First Time Home Buyer program to help make your transition effortless!